President France Córdova traveled to Africa in April -- the first Purdue president to do so -- visiting the countries of Ethiopia and Tanzania. During the trip, she visited universities and government entities on behalf of Purdue to foster a collaborative focus on research and education. She was accompanied on the visit by Gebisa Ejeta, distinguished professor of agronomy, director of the Purdue Center for Global Food Security, and 2009 World Food Prize winner. Also accompanying the President were Arden Bement, director of Purdue’s Global Policy Research Institute, and Chris Foster, first gentleman and director of Discovery Park K-12 programs. 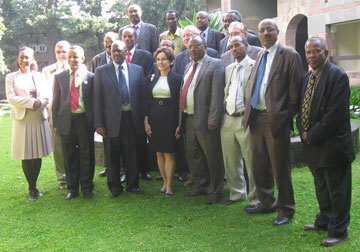 The Purdue contingent made stops at the United Nations complex and the U.S. Embassy in Addis Abada, Ethiopia where she met with officers of the Public Affairs Office, the Foreign Agriculture Office, USAID, and the Minister of Education. President Córdova, Professor Ejeta and Dr. Bement attended and spoke at a meeting with the presidents of ten Ethiopian public universities organized by the Higher Education Strategy Center. Memorandums of understanding (MOU) were signed with the organization of these ten universities. The trip also included a visit to Tanzania to tour the Nelson Mandela African Institute of Science and Technology (NM-AIST). Dr. Córdova also signed a memorandum of understanding (MOU) with NM-AIST to foster collaborative engagement focusing on specific research projects and areas of study key to global food security. A local press release about the visit to NM-AIST is available here.